Lusa Booty Balm is cloth diaper safe and will not clog or stain cloth diaper fibers. Lusa Booty Balm soothes your baby’s sore bum naturally. Lavender, calendula, and chamomile infuse rich oils giving this healing essential oil blend the power to cure red rashy skin. Lusa Booty Balm works for diaper rash, cuts, scrapes, drool rash, windburn, sunburn, and anyone with sensitive skin. Lusa Booty Balm is a truly wonderful skin treatment. When nothing else works this should do the trick! Most ingredients are certified organic. 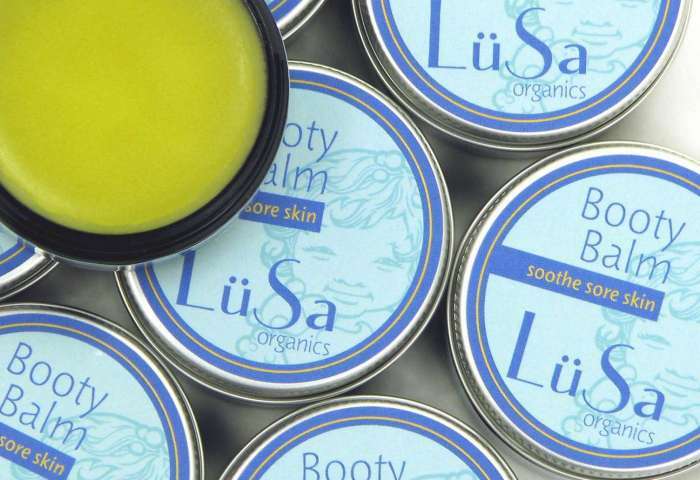 Use Lusa Organics Booty Balm to prevent or treat diaper rash. To read our article on diaper rash prevention tips, click here.